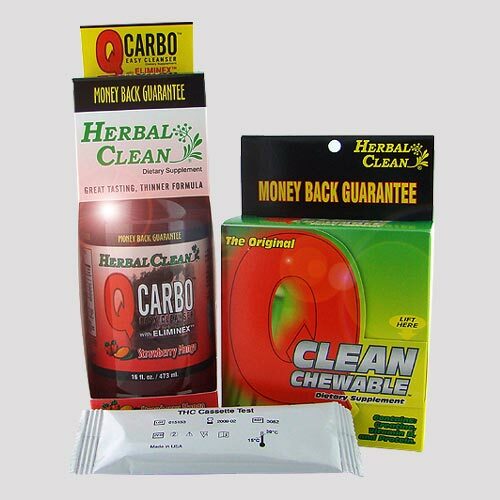 The One Hour Emergency THC/Marijuana Detox Kit for People Under 200 pounds contains one bottle of QCarbo Easy Cleanser, one QClean Chewable Supplement, and one home test device. A special blend of vitamins, minerals, and botanicals provide exactly what you need to pass a urine drug screen on short notice. Perfect for the occasional recreational users, the One Hour Emergency Detox Kit for People Under 200 Pounds is a potent and reliable solution. Be ready to start using your detox kit approximately 2 hours before test time. Drink the entire bottle of QCarbo two hours before test time. Wait 20 minutes and refill the empty QCarbo bottle with water and drink again. Wait 40 more minutes urinating as frequently as possible. After urinating several times use the home test device included with your kit. If results are negative for drug metabolites (passing, 2 lines) proceed to your test immediately. If results are positive for drug metabolites (failing, 1 line) continue to step 5. Chew the entire QClean tablet with 32 ounces of water. Urinate several times while waiting an additional 1 hour before going to your test. Abstain from any unwanted substances for at least 48 hours prior to test time. On test day eat and drink normally and avoid heavy meals in the hours before your test. Be sure to stay well-hydrated daily and make sure to urinate frequently when using the detox kit. Results are temporary lasting up to 6 hours with maximum potency approximately 2 hours after use. Time your use accordingly. Pregnant or nursing women and individuals with special health needs should consult a health professional before using any dietary supplement.